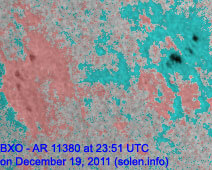 Last major update issued on December 20, 2011 at 05:30 UTC. 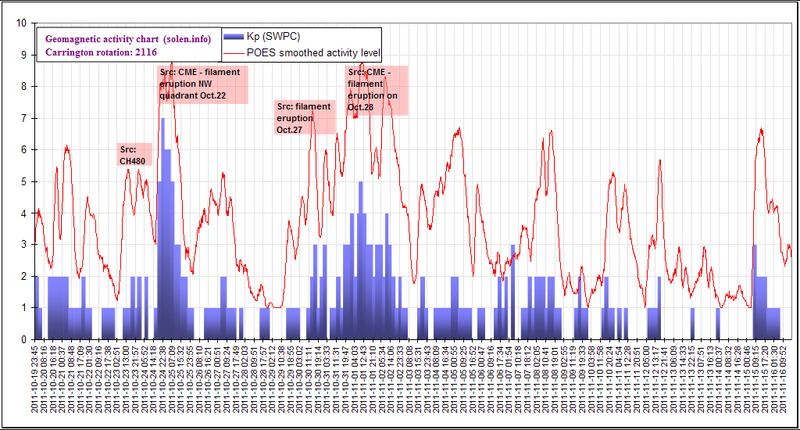 The geomagnetic field was quiet to unsettled on December 19. 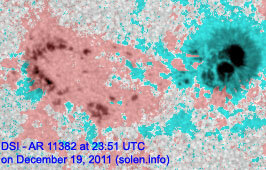 Solar wind speed ranged between 284 and 436 km/s under the influence of a low speed stream from CH489. 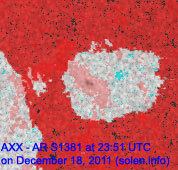 Solar flux measured at 20h UTC on 2.8 GHz was 128.2 (decreasing 14.2 over the last solar rotation). 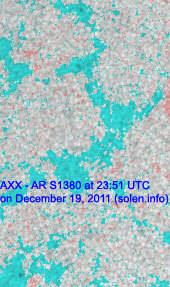 The planetary A index was 6 (STAR Ap - based on the mean of three hour interval ap indices: 5.8). 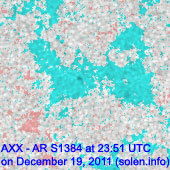 Three hour interval K indices: 11101232 (planetary), 12111232 (Boulder). 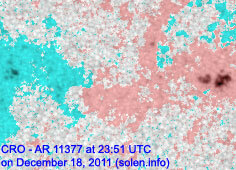 Region 11374 [S19W79] was quiet and stable. 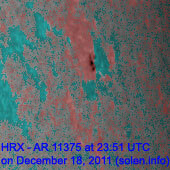 Region 11376 [N21W25] decayed slowly and quietly. 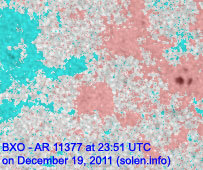 Region 11377 [N12W26] decayed slowly and quietly. 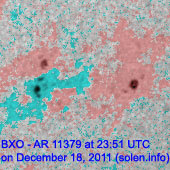 Region 11379 [S29W47] decayed slowly and quietly. 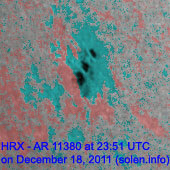 Region 11380 [S21E47] added several trailing spots while the leader spots lost the rudimentary penumbra. 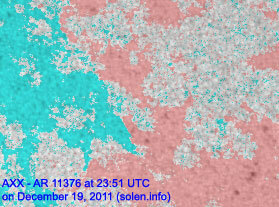 Region 11381 [S18E10] decayed slowly and quietly. 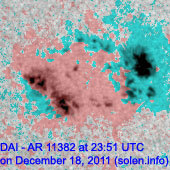 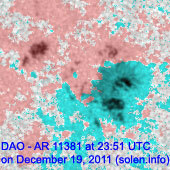 Region 11382 [S18E17] developed further and could produce C flares and maybe a minor M class flare. 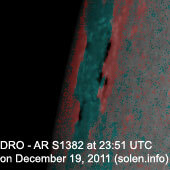 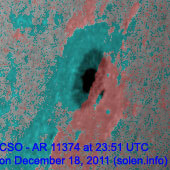 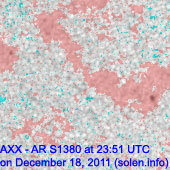 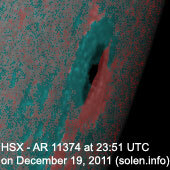 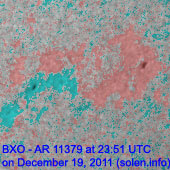 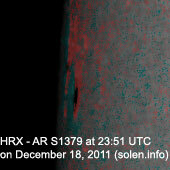 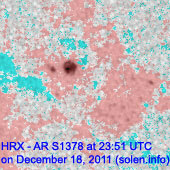 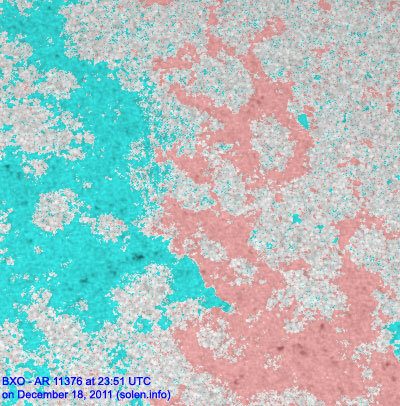 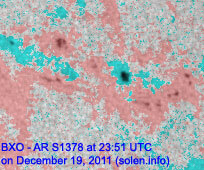 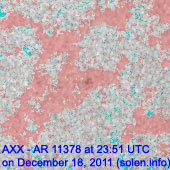 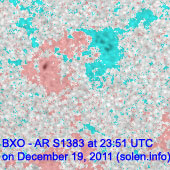 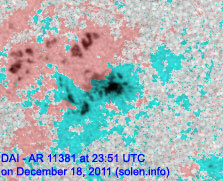 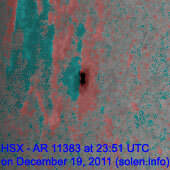 New region 11383 [N03E69] rotated into view at the northeast limb on December 18 and was numbered the next day by SWPC. 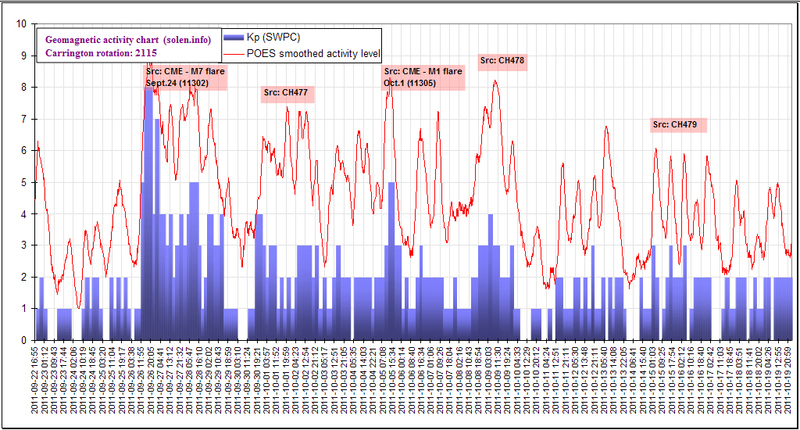 December 17-19: No obviously Earth directed CMEs observed. 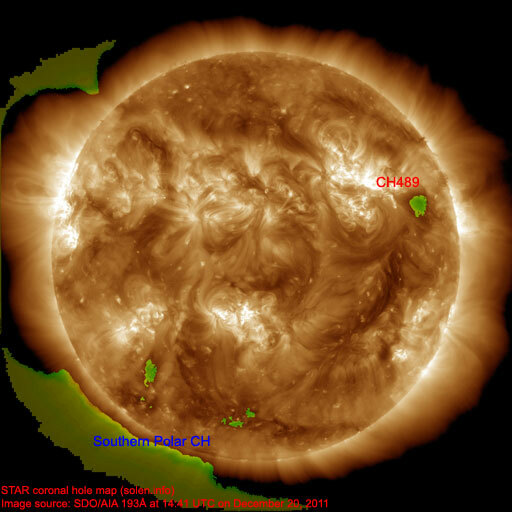 The geomagnetic field is expected to be mostly quiet on December 20, weakly under the influence of CH489. 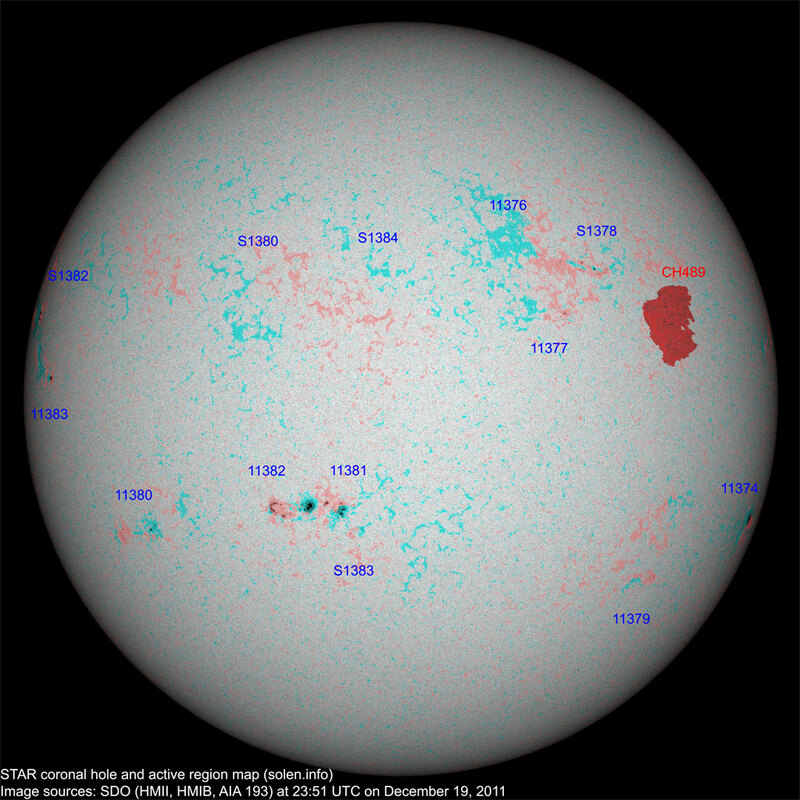 Quiet conditions are likely on December 21-23.